Beautiful card Sassy!!! I LOVE it and love the colors!! I too love making pretty cards, men cards I hardly ever make, only when I need them for birthdays,fathers day, and so on...heheheheheheh Girl cards are much more fun!! 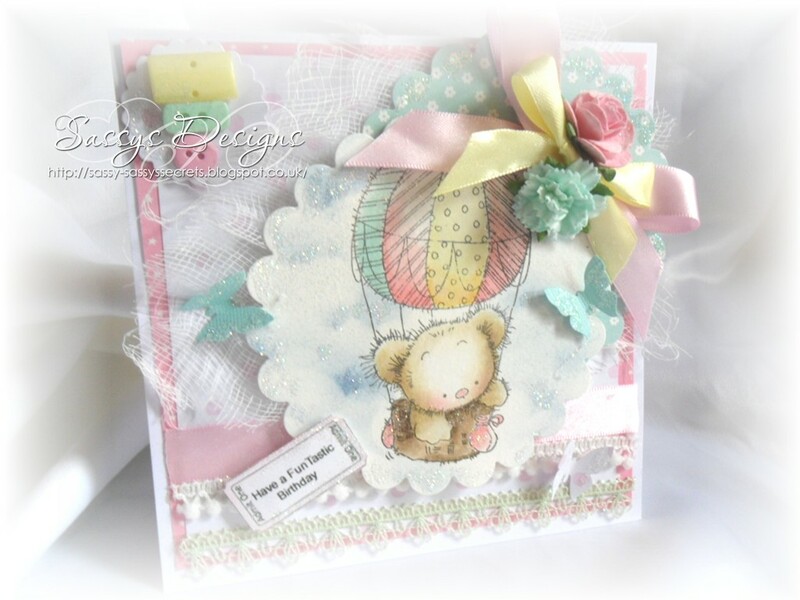 :) or baby boy cards can be too!!! Oh my - what a beautiful card!! I've cart my cart for Wild Orchids right full, and going to put in my order! After seeing such a beauty this morning, I'm finishing up and getting my big stash. Gorgeous card, Sassy! Well, say what you might, Sassy, but you even looked better from this side of the computer!! So rice crispy's or not, I think they saw some of the positive inner beauty come out and you were actually feeling better after getting such great news from your doc! After all, it is great news to find your feet are being caused to swell from meds - not the dangerous part about you tongue, though! God is so good, that you went to the doc on the day it got worse! I'm happy for you - now maybe you'll be able to get around better, and that always makes us feel so good!! Have a great day - and I believe people were actually smiling because they saw your inner beauty, not the crispy's! What's not to love!!! 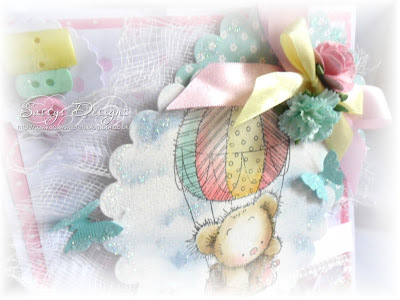 Such a pretty card, love the pastel colours. And what a funny story - never a dull moment right enough! Sweetie, so glad you found what's made your feet swell up and everything! Hope the other meds will make you feel happy too! Guess what...I just did some hoovering today LOL... and all me daft cats jumped out the cat flap LOL..
Aaaaw, I love your sweet baby card, isn't the bear the cutest??? So wonderful! A gorgeous card. The image is so sweet. What a sweet card, Sassy. I absolutely love the colours you chose for it. Wonderful pastels. And your colouring and embellishing is just fabulous. Have a wonderful week, hun! A gorgeous card Sassy. The image is lovely and such fab embellishments. Gorgeous pastel colours too. OH MY STARS!!! I am rolling on the floor laughing at your rice crispy story! You poor thing ... you'd think these 'friends' would have said something other than 'are you feeling okay' LOL!! Anyways ... your card is ADORABLE and the soft pastels are beautiful! Well done my friend. Hi Sassy! This card is absolutely stunning in every way! And what a funny story! I can't believe they didn't tell you about the rice krispies! I'm so glad that your doctor will be regulating your medications so that your swelling goes away! Oh, I love you Sassy - you make me laugh so much. Made myself laugh yesterday when I got ready for work in my 'professional' clothes, put on my ID badge and got in the car .... with my big fluffy slippers on, lol! Can you believe they let me teach children, lol! Another beautiful and perfectly made card again today. Love it as usual.